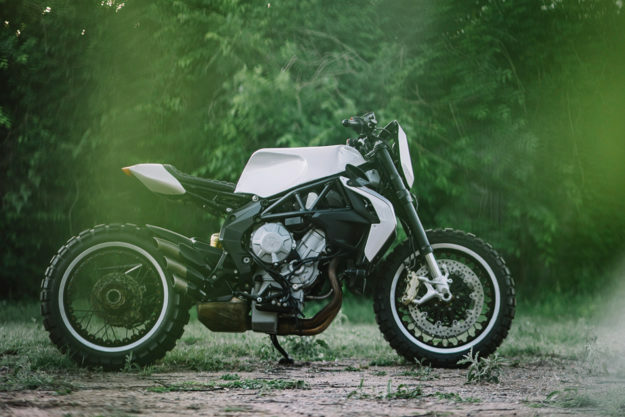 Custom motorcycles are, for the most part, a selfish pursuit. 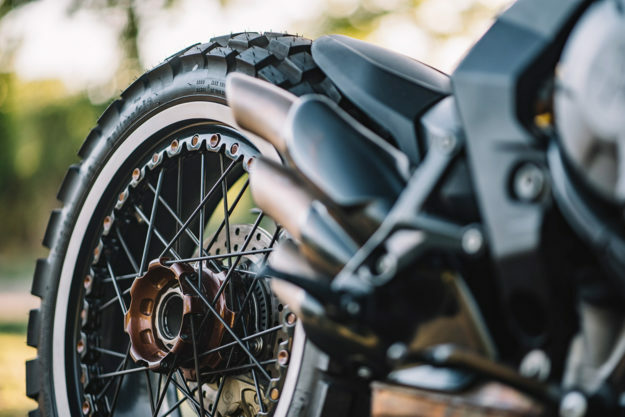 We take perfectly good motorcycles and customize them—not because we particularly need to, but simply because we want them to look prettier, ride better, or just suit our tastes more. But Sofi Tsingos (GT-Moto) and Alicia Elfving (MotoLady), are using their skills to actually make a difference. 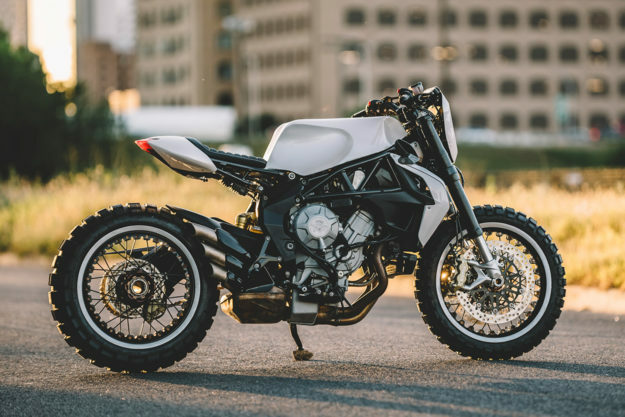 Collaborating under the moniker ‘GT-Moto Lady,’ they’ve built this slick MV Agusta Brutale 800—not for top bragging rights at the next group ride, but so that they can raffle it off for charity. The two first met when Alicia did a feature on Sofi, and the custom 1977 Honda CB550 that she built with her dad, George. From then till now, their friendship has blossomed. With each lady in a different state, the build became a long-distance project. 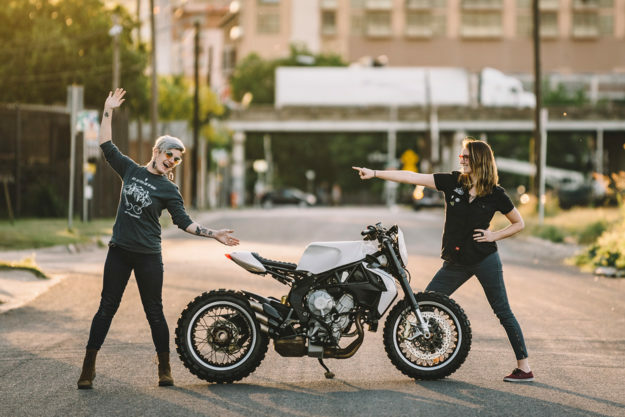 Alicia took responsibility for sourcing parts, promotion and planning, and helped Sofi sketch out the entire design when the bike was first torn down. Sofi took on the more hands-on tasks. Both are passionate about the fight against cancer, so they picked St. Jude’s Children’s Hospital (who have a very active cancer research facility) as their beneficiary. All that was left was to choose a modern bike to chop up. 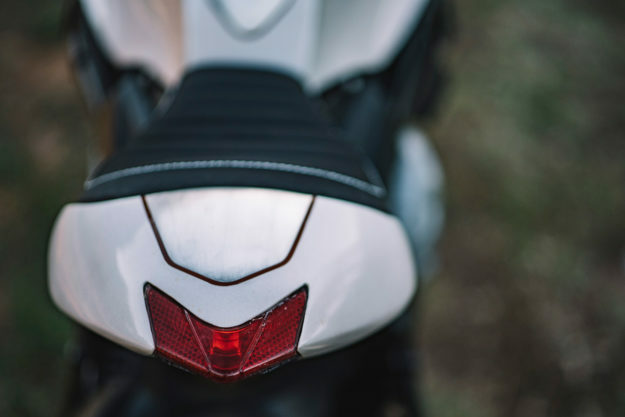 It wasn’t long before the ladies had a 2014-model MV Agusta Brutale 800 to work with. 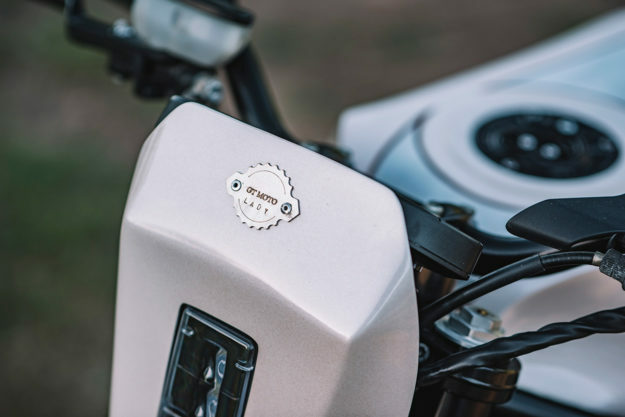 It’s a pretty incredible machine right out the box, so the decision was made to leave the base bike alone, and focus on revising the styling with all-new bodywork. 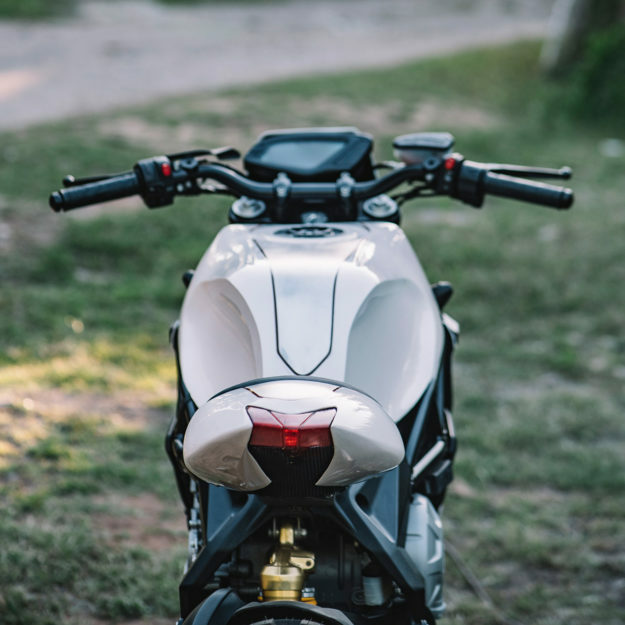 So this Brutale is still running a stock chassis—including the suspension and brakes—and its original airbox, exhaust system and mapping. Taking all the factory plastics off the rear half of the bike revealed a killer trellis subframe, but it exposed some electronic bits, so Sofi had to relocate the regulator/rectifier and a sensor. She then modified the subframe, and shaped a new tail section that would wrap around the stock taillight (a part that the team really wanted to keep). XTreme Upholstery in Denton, Texas handled the seat cover, using a black textile material with contrast stitching in white. 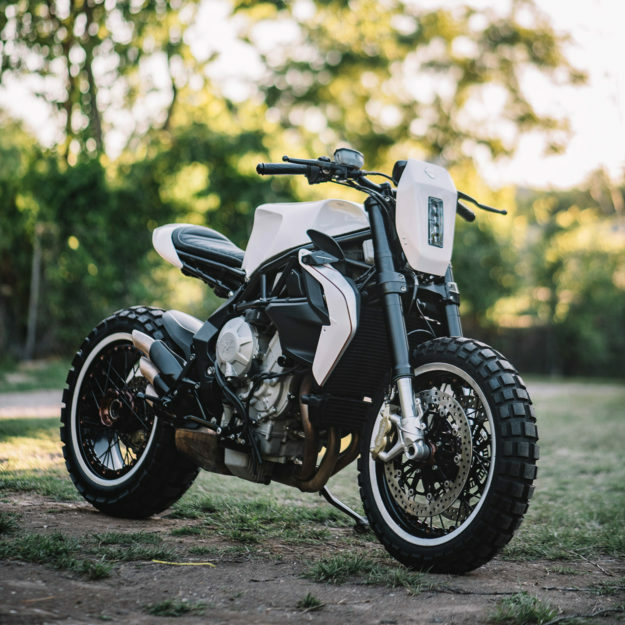 A keen eye will notice that the Brutale’s wheels aren’t stock. Alicia and Sofi opted for a burly set of wheels off a Dragster, but had them repainted, and then trued by the expert hands of Woody’s Wheel Works. They’re running Continental TKC80 tires. 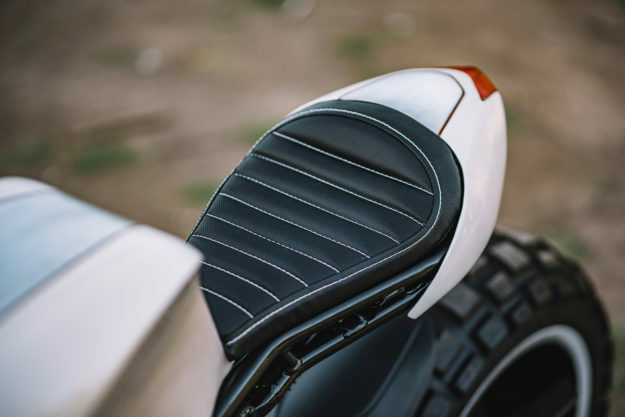 In keeping with the ‘if it ain’t broke, don’t fix it’ philosophy, the control area was simply treated to a pair of grips and mirrors from Rizoma. 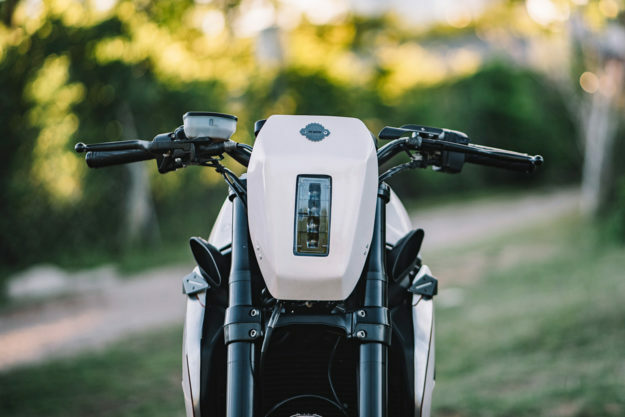 The gas cap is a Vortex item from a Ducati 748; it’s attached via a fitting that Sofi milled out on Junior’s 40-year-old mill. The front LED light is from JW Speaker, but Alicia warns that it’s not, strictly speaking, ‘road legal.’ The turn signals came from Motivations USA in Austin. Two liveries were picked out, and put to a vote. In the end, the current scheme won the people over; a white finish with copper pearl, and sections of raw aluminum flanked by candy copper pin striping. So if you’d like a chance to take this brawny Brutale home, head over here and buy a ticket (they start at $25). The draw’s happening in a little over a week, so best you hurry! Alicia and Sofi would like to thank the companies that supported this project: MV Agusta Corporate, who donated the bike, Continental Tires, Woody’s Wheels Works, Crosslink Powdercoat, Junior Burrell, Rizoma, Xtreme Upholstery and JW speakers.